Get stuck into the action without putting yourself at risk of a game-ending injury with the Atomic V3 Body Armour in Black and Blue. 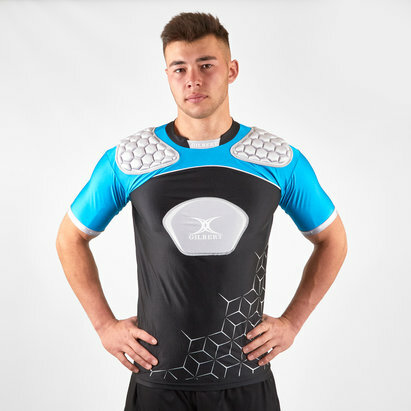 This body armour from rugby specialists Gilbert is essential for any player and features strategically placed 5 and 10mm EVA foam pads in the shoulders and across the chest to absorb the shock impact of heavy tackles and reduce the risk of injury. Made from polyester and elastane, this protective top has a tight fit to ensure it delivers the protection you need and has moisture management technology built into the fabric to help keep the wearer feeling drier and more refreshed during the heat of an intense match. 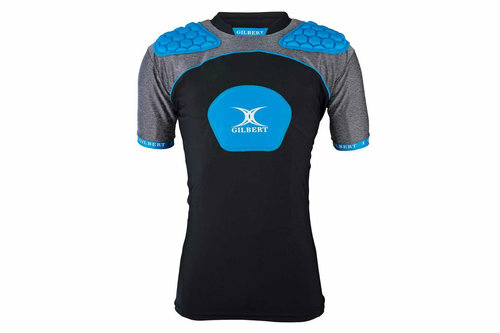 Arm yourself for every encounter and take on even the toughest of tackles with the Gilbert Atomic V3 Body Armour.